Vizio is no stranger to our lab, but its first desktop PC entry, the Vizio CA27-A1 all-in-one, shines bright. Priced at $1250 (as of August 24, 2012), the Vizio CA27-A1 comes stocked with an Intel Core i5-3210M processor that runs at a standard 2.5GHz but ramps up to 3.1GHz when using Intel's Turbo Frequency technology. This is coupled with 4GB of 1600MHz DDR3 RAM to support a speedy, responsive machine. The screen is a beautiful 27-inch display with a maximum resolution of 1920 by 1080 pixels. It has a slight tilt to get a better viewing angle and to alleviate any glare that might catch the reflective screen. But it's not a touchscreen, which feels like a bit of an oversight with Windows 8 so close to release. While a touchscreen isn't necessary, it could be useful with Microsoft's forthcoming operating system. 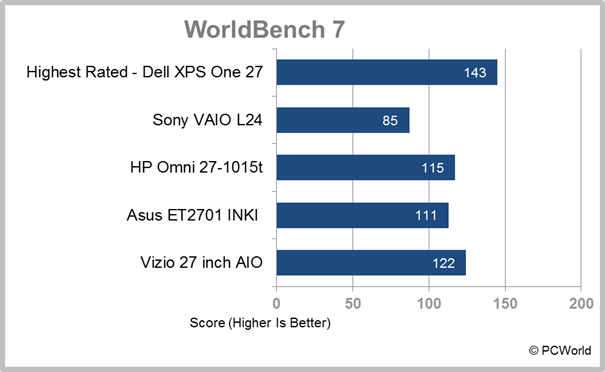 The system scored 122 on our strenuous WorldBench 7 benchmark suite, making it 22 percent faster than our baseline system, a fully equipped tower. The CA27-A1 manages to be faster, sleeker, and more functional than that baseline, a difficult combination of goals to achieve in any PC. One goal for most all-in-one desktop PCs is to be as thin as possible. This often means sacrifing some of the bulkier, more powerful components. Vizio managed to squeeze in a discrete GPU, albeit a mobile one: Nvidia's GeForce GT 640M LE graphics card with 1GB of memory. While the CA27-A1's specs will let it run some less strenuous games well, it struggled a bit on our graphics/games test. 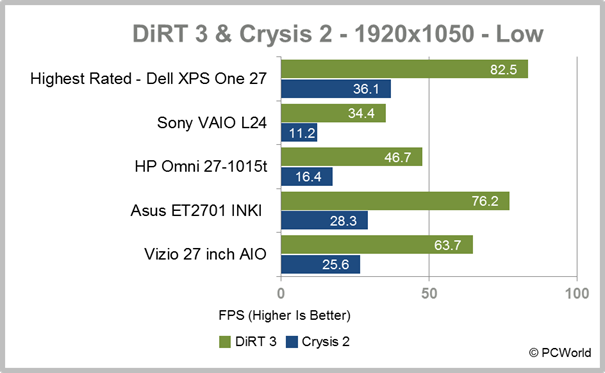 We ran DiRT 3 and Crysis 2 at the highest graphics setting at a maximum resolution of 1920 by 1080 pixels. The system managed 35.7 frames per second on DiRT 3 and 16 fps on Crysis 2. Unfortunately this won't make for an enjoyable gaming experience. The CA27 does manage to cross the coveted 60-fps mark when DiRT 3 is changed to low graphics settings (63.7 fps) or the resolution is lowered to 1024 by 768 pixels (66.2 fps). Crysis 2 doesn't quite cross that threshold: When the graphics are set to low and the resolution to 1024 by 768 pixels, it reaches 55.9 fps. Of course, you can make it a little prettier, but acceptable performance is not guaranteed. The ports are all located along the base of the unit, mostly in the rear, which can be a pain to get to regularly. Also, a lip on the base extends about an inch, which unfortunately hides the ports. While it gives the system a clean, sleek look, it makes the ports impossible to find without some serious maneuvering. The ports include one for eSATA, two for HDMI for multiple devices (such as a video-game console and a cable box), and four for USB 3.0. I was pleased that Vizio went straight to full-on USB 3.0, leaving out the older, slower USB 2.0 standard entirely. The CA27-A1 offers all the connectivity an all-in-one needs, including 802.11n wireless, a gigabit ethernet port, and Bluetooth for other wireless accessories. And that brings us to the accessories, where the company's decisions are a bit of a mixed bag. Its wireless keyboard, to begin with, doesn't really impress. It's thin and light, but the keys lack texture and are flat. And instead of a mouse, Vizio offers a large wireless touchpad. It works well if you are computing from the couch where you'd have no flat surfaces for that accessory, but some users may miss the mouse. However, the touchpad will make the system more Windows 8-friendly. Vizio also includes a 2.1 surround-sound subwoofer to provide some strong audio out of small speakers. A front-facing, 1.3-megapixel, 720p webcam and an integrated microphone are also present for those who rely on video conferencing. Finally, you get a small remote to control media functionality. It's easy to see that this system's main goal is to be a digital media machine. However, the CA27-A1 doesn't come with an optical drive. While playing games and installing software via CDs is rapidly becoming obsolete, when a computer strives to be the final answer as a media device, the lack of a DVD or Blu-ray drive seems limiting. It feels a little counterproductive to buy an external optical drive when one of the CA27-A1's goals is to relieve desk clutter. Vizio did make some smart choices when pricing this system. At $1250, the CA27-A1 stays just below similar products from major competitors without giving up performance. The Asus ET2701 INKI, for example, costs about $50 more ($1299 as of 7/9/2012) and didn't perform as well on WorldBench 7, scoring a 111. The two models have nearly identical specs, though the Asus does sport a speedier Core i7-3770S. 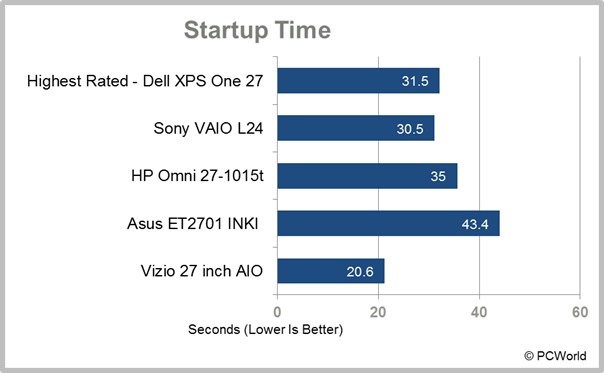 Where the Vizio manages to beat the Asus is in boot-up time: The Asus took over 20 seconds longer to become fully functional after booting. You can thank the 32GB solid-state drive in the CA27-A1 that is used for hard-drive caching. Though the SSD doesn't make for any extra storage space, it turns the slower 1TB, 5400-rpm drive into a simulated SSD with Intel's Rapid Storage technology'a perfect mixture of price efficiency and performance. Overall, the CA27-A1 is a great entry to the affordable all-in-one market. You get plenty of performance bang for your buck, though it isn't without shortcomings. Vizio put a lot of thought into the system's performance, but perhaps less in its media functionality. I would have liked to see Vizio forego a feature or two to make room for a Blu-ray drive and still keep the price competitive. The system is great for students on a budget or the family that needs a digital media player in an extra room, and since it is one of the lowest-priced such systems, the investment will be a reasonable one. The Vizio CA27-A1 offers some good media capabilities at a great price, giving it a strong introduction to the desktop market.